This entry was posted on Sunday, September 28th, 2014 at 9:36 pm and is filed under books, film, grammar, language, usage. You can follow any responses to this entry through the RSS 2.0 feed. You can leave a response, or trackback from your own site. The redundant article in “the hoi polloi” reminds me of some similar examples in Thai language. People often refer to “the island of Koh Samui”, when, in fact, Koh means island. Another example is the name of the river which runs through Bangkok, the Chao Pyah. In the 19th Century Europeans often called it the Maenam River, not realising that Maenam simply means river in Thai. But I doubt that any Thai would bother correcting such usage. It’s debatable whether “her husband and me” is correct grammar. Stephen Pinker addresses this elegantly in The Language Instinct. In essence, the argument for the correctness of “her husband and me” (and the incorrectness of “her husband and I”) is based on the flawed assumption that the sum of the phrase can be logically divided – as in “she was watching her husband, and she was watching me”, therefore she was watching her husband and me. The only problem with the logic is that she WASN’T watching her husband and also watching me – she was watching herhusbandandme. People who choose “her husband and I” are not breaking any rules of grammar other than those prescribed from the same specious realm that says “never split an infinitive or end a sentence with a preposition”. Thanks for those examples, Gerry. That kind of redundancy is quite common with geographical terms that mix languages; Wikipedia has an enjoyable list of what it calls tautological place names. Ken: It’s a very old debate, often covered by usage authorities under “between you and I”. Henry Sweet made essentially the same point as Pinker in 1892, that “you and I” constitute a grammatical unit unto themselves (“a sort of group-compound, whose last element became invariable”). But I don’t see how that affects the legitimacy of the less contentious construction “between you and me”, or in this case, “watching her husband and me”. Yes, I struggle with that too. Pinker quotes a linguist who argues that “between you and me” is actually UNgrammatical – in any language. That may be so, but if so it’s too deep for my poor brain to grasp. I know this is a bit tangential but it’s “than” that bugs me. The peevers say that “taller than me” is incorrect as it is an ellipsis for “… than I am”. But I have never heard or seen an example of “… than she” or “… than we”. Certainly, on the basis of usage, the peevers must be wrong, as “than I” itself is pretty rare, even in writing. But, irritatingly, however desriptivist I claim to be, I have an inner peeve that makes me say “than I” ( and doesn’t like me splitting infinitives either). Does anyone know of a good language therapist who can clean out my peevish subconscious? One technique I’ve found effective in neutralising peeves is to deliberately use the taboo item. It doesn’t always work, but sometimes I repeat a word or phrase I instinctively dislike and it makes them less objectionable. Similarly we have “the SALT talks”, where SALT stands for Strategic Arms Limitations Talks”. A tad less redundantly, there is “the UN nations”. But nobody complains (except in the mood of irony) about the Missisippi River” or “the Gobi Desert”. There are times when the redundancy is almost necessary: “The rebels fired a Sam …” is likely to cause momentary confusion where “Sam missile” would not, and “I’ve forgotten my pin is ambiguous (especially in places with pin/pen merger) where “I’ve forgotten my pin number” is not. The author’s grammar references in parentheses look so unsubtle that they could have been intended for her editor. But that’s books. Was the film less direct with them or not do them at all? Did the author really write ‘pacifered’? From a quick Google search, I find that ‘pacifier’ seems to be an incorrect variant of ‘pacifier’, and neither variant sounds good (to me) with an ‘-ed’ at the end. The first ‘pacifier’ should be ‘pacifer’. An automatic spelling checker (in my brain, in my fingers or in some software) is to blame for the error. Of course, we don’t know if the comments about grammar reflect the author’s own views or whether she inserted them to help create the character of the narrator. John: Some sticklers get very worked up about these sorts of redundancies (the notorious PIN number, HIV virus, and ATM machine). I would clip them in editing, but in casual usage I don’t mind them at all. Terry: That’s true, and a good point. It’s one reason redundancy is often very helpful. Roger: The grammar asides are deliberately unsubtle – it’s part of the narrator’s persona, as Barrie suggests might be the case. I don’t yet know if they feature in the film. Michael: It’s probably pacifiered, and I’ve edited to fix this. (Having borrowed the book, I can’t check it right now, so this is based on a look around online.) Thanks for the catch. I was one of the first readers of this novel but do remember the pickiness of her grammatical asides. Needless to mention I am overjoyed at her success but am reluctant to undergo book-movie-letdown. I was pleasantly surprised by it, WWW, having read similarly hyped popular thrillers and found them severely wanting (Before I Go To Sleep comes to mind). I’d be interested in reading her other work now. Your caution towards the film is understandable, but I expect it will be a fair effort given that Flynn herself wrote the screenplay and David Fincher directed it. Whether I can take Affleck in the lead is another matter! It’s been a while since anyone commented on this topic, and maybe by now, Stan, you’ve seen the movie. I thought the movie was excellent and that both leads were very good. But I don’t recall the grammar references making it into the movie. Thanks for reporting back on this, Brom. I haven’t seen the film yet, and probably won’t see it in the cinema, but look forward to watching it eventually. I just found your website and I love it! I am a grammar “natzi” or “aficionado” (depending on whom you ask! 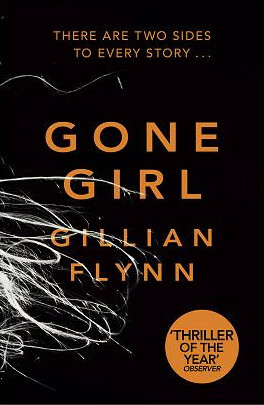 ), and I just loved Gone Girl because of the grammar and other interesting inclusions. I love this website–it seems right up my alley! Thanks, Adrienne! I don’t consider myself a ‘grammar nazi’ (a term I tend to avoid), but I’m certainly a grammar aficionado.